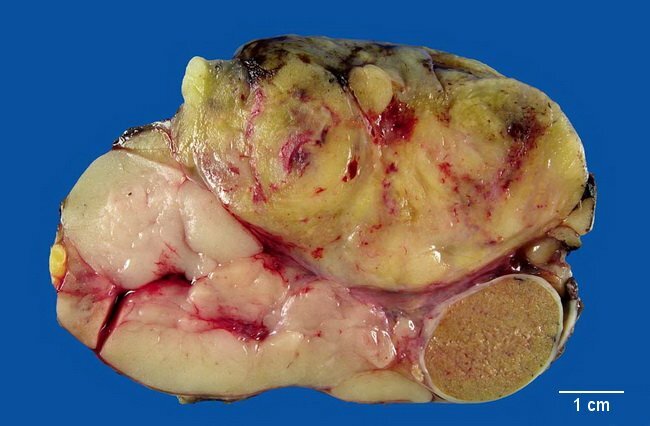 Paratesticular liposarcomas are rare tumors that usually involve spermatic cord (almost 80% of cases) followed by testicular tunics and epididymis. The age range in one of the largest studies (see Ref.) was 41-87 years with a mean age at presentation of 63 years. Most patients present with a painless paratesticular mass which is commonly diagnosed clinically as inguinal hernia. The tumor size ranges from 3 to 30 cm. Grossly, they are often well-demarcated and have yellow-white lobulated lipoma-like appearance. Image copyright: pathorama.ch. Ref: Montgomery E, Fisher C. Paratesticular Liposarcoma : A Clinicopathologic Study. Am J Surg Pathol 27(1):40-47, 2003.